Yesterday we did the defense, so naturally today we will do the offense. However, this is a little bit less informative due to the injuries the team sustained last season. I’m going to skip the original chart I made because it was based on perceived ability (not performance), and included all of the injured starters. 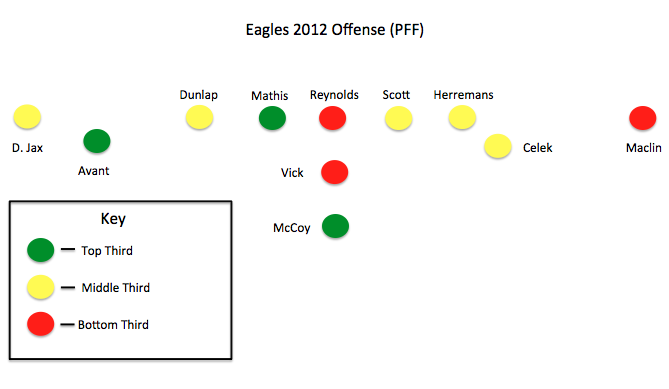 Using PFF’s grades, this is how the offense looked last season. A couple of notes, then I’ll highlight a few areas. Due to the injuries, there were a number of players that received playing time. I used whichever player took the most snaps as the rule for inclusion. Watkins and Scott played nearly the same amount, but they ranked similarly so the color wouldn’t change. There were also a few players who were on the edge as to which color they deserved (for instance Shady was the last spot in the top third). I could have done the mixed colors again, but I wanted it to be as clear as possible. – Both Jeremy Maclin and D-Jax played well below their potential. Perhaps not surprising given the QB situation and the state of the O-Line, but it remains a cautionary note going into next season. We know Maclin has the talent, but we can’t pretend he’s a lock to realize that next year. – Jason Peters will hopefully come back as green. – I know everyone loves Jason Kelce, but PFF graded him close to the bottom for his rookie year. I think he’ll be good, but this is another position at which fans seem to be buying the upside without realizing there’s a reasonably significant chance it doesn’t work out. For the record, his rating in 2011 would have placed Kelce LAST in 2012, below Dallas Reynolds. – The right side of the line is tough to project. If the Eagles draft a RT at #4 and shift Herremans back to RG, then both of those spots could go green. Keep that in mind as we get closer to the draft. Drafting a starting RT could provide immediate improvement at TWO positions. – Although I don’t need to mention this, having your QB grade out red is bad. Of the 27 QBs that played more than 50% of their team’s snaps, just 4 ranked worse than Vick (Ponder, Fitzpatrick, Sanchez, Weeden). – It will be interesting to see how James Casey and Brent Celek split time. I know Kelly says he will use a lot of 2 TE sets, and Casey can line up almost anywhere, but it wouldn’t surprise me at all to see Casey supplant Celek as the starting TE. – Finally, PFF’s ratings shouldn’t be taken as gospel. So feel free to disagree with the colors above, just note that the source is Pro Football Focus, not me. That’s all for today. Working on some bigger stuff that takes time, but the results should be fun. At full health and ability, they’re both green. That’s why I went to PFF though, to take my opinion out of it. Have to face facts with Maclin, this is a HUGE year for him. Time to step up.